I saw a great play for all time yesterday. It is majestic, sweeping, searing, heartbreaking, uplifting in the same degree as the great Shakespeare tragedies that makes brutally shockingly clear the insidious cancer of violence and ambitions that masked in a cause, destroys the good, the profane, the evil, the powerful, the weak through their own individual selfishness and weaknesses. A triumphant tour de force that gets a hold of you from the ominous prologue to the shattering you-won’t-see-it-coming climax that drains you, uplifts you, resolves you and wises you up. 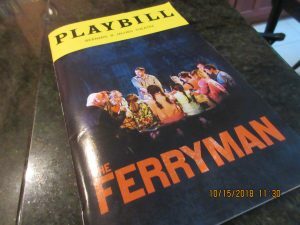 The Ferryman may be the most perfect play perfect performed ever written. There are no spots of dead dialogue though the play is three hours long. No transitions looking for a connection. Not one yawn escaped my mouth. You the viewer as a God from Olympus looks down sees the weaknesses and needs of others playout their inevitable tragedy. Hopes dashed, ambitions, explode in collisions of greed, lust, manipulation all those things that are let loose in the chaos of these best of times and worst of times. The genius of this morality play poses the questions that have always been asked by the creators for the stage in perhaps the most unique format ever and covers them all! What is moral anyway? Is true love moral if it hurts and destroys? Is lust justifiable if you are unhappy? Is the quest for justice just a mask to assume power and manipulate to your advantage? Is love but a fleeting reason-destroying emotion bringing the lover to ruin? Is manipulation of the mentally weak and persuadable young a right of the plotting older generation? Is violence the ultimate weapon to get your way as long as someone else does it? The actors perhaps are the most cohesive reality infused committed cast with a mission Director Sam Mendes has ever inspired to make this drama of the Irish Republican Army as real as today’s headlines. The IRA was one of the first modern terrorist organizations to use bombs in public places and assassinate informants and the play is based a real member of Mr. Butterworth’s family and the IRA assassination of her husband. As I listened raptly to every line of this play, I marveled how the dialogue was so real, how it flowed, with tides and ebbs from hope, to despair, to evil, just like everyday interaction. Never have I seen a play with no dead spots in dialogue. No scene that does not build the emotional nuclear reaction building in the characters. If the play’s your thing, you will never forget this play. Director Mendes has honed, shaped embellished from the most nuanced emotion to the most wrenching display of the evaporation of all hope for character after character. From the year old baby. Theo Ward Dunsmore who performs flawlessly, to the child actors who precociously interact with some of the best comic lines, (Matilda Lawyer, Michael Quinton McArthur, Willow McCarthy, Brooklyn Shuck, Carly Gold,Will Combs, Bella May Mordus, to a live goose, and the precocious Pierce the Bunny. Mendes orchestrates the moves, the emotions, the body languages into the stellar leads– Paddy Considine as Quin Carney and the fiery woman he cannot have, and Laura Donnelly as Caitlin Carney triumphant, tragic tough as nails heroine. Donnelly won Best Actress Award at the Olivier Awards for creating this role. I did not know her until I saw her Sunday, but I know her now and she is beyond Bernhardt. These two are surrounded by a lovable Irish family, and do not fear. You will understand all the Irish blarney and brogue—that is not a problem. The dialog, the songs of harvest time the green of Ireland shimmer in this play. It is perfectly acted and directed. Serious, funny, touching, tragica it’s what you want in a play. There is even a villain in this play whose fanatic ambition and genius for manipulation conduct Quin Carney’s family to its denouement brought about by the flaws of all. That actor is Stuart Graham as Muldoon the manipulative IRA leader. His use of blackmail, cruelty, irony in the most elegant of dialogue that chills will remind you of the rich, the powerful, the evil of today. Graham delivers smarmy coldness, misogyny and blackmail with a darkness of evil and an inevitability of triumph. Justin Edwards creates a heartwarming Tom Kettle, a mentally challenged workman who has long had an admiration for Caitlin Carney (Laura Donelley). When Caitlin’s husband is found in a bog, shot in the head with hands tied behind him, the victim of an apparent IRA assassination, Mr. Edwards in a poignant eloquent proposal asks Carney to marry him because he has loved her since she first smiled at him. This sequence among many in the play will hold you spellbound. The scene is perfect. Like every scene in this play. Tom Glynn-Carney as Shane Corcorcan renders a Frankenstein transformation of a teen gradually being seduced by the prospect of justice for the starving members of the IRA who are on a hunger strike during the Margaret Thatcher administration. As his eyes become more wild and bright, the possibility of violence becomes more attractive to him until he becomes—his believability of inflection, the ease at which a good person buys in to hate and cruelty to the innocent. Fionnula Flangan is touching as the reminiscing Aunt Maggie Far Away whose prophecies and memories and pronouncements to the children (“Love is nothing but sorrow”) ring hollowly true. The acerbic Irish nationalist , Thatcher-hating chain-smoking Aunt Patricia Carney, acerbically correctly played pitch perfect by Dearbhla Molloy, and the lovable Irish uncle Patrick Carney (Mark Lambert) are integral foils. I mention these players to deliver just how seamless, all-in this cast is. It is harvest time in Ireland at the Bernard B. Jacobs Theatre, a harvest you will never forget. You will see yourself in this play no matter who you are. You, as Gods from Olympus will be staring down at earth from the mezzanine, become parts of this beloved family, wondering what justice really is. Wondering how it can possibly end right and send you into Autumn in New York feeling wiser, better, and knowing what you have to do. I will never forget this play.